In today’s lesson our quilt top becomes a real quilt! I love this stage because there is something about the quilting that transforms the pieces into a cohesive whole. 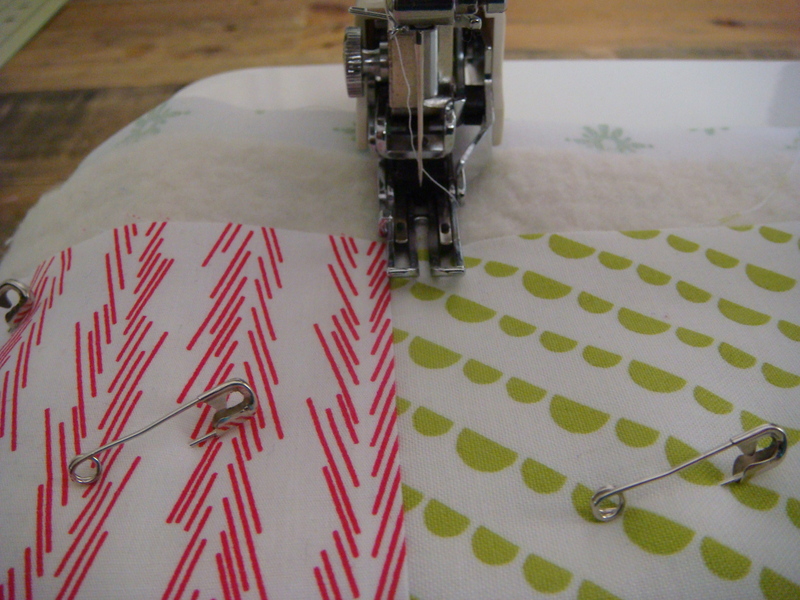 Quilting straight lines on your home machine – this is the most basic style of quilting and what I’ll be demonstrating in this tutorial. 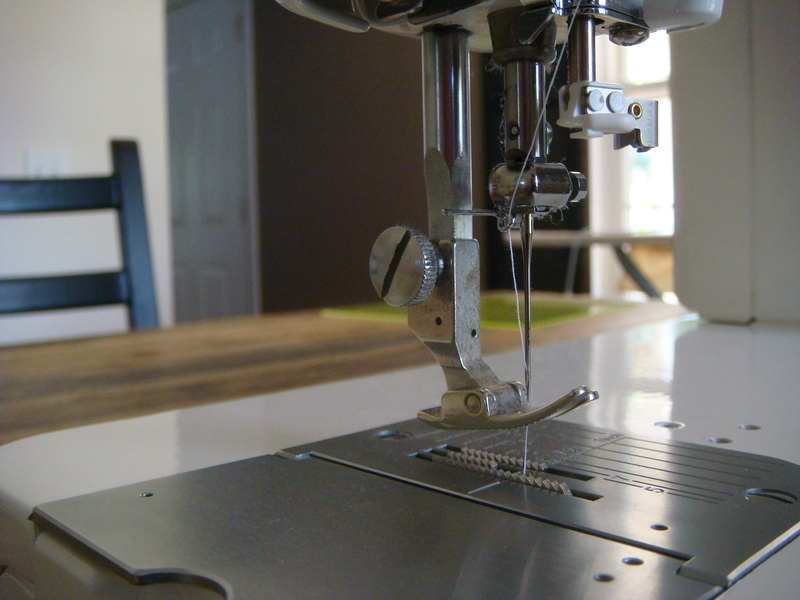 Free motion quilting (FMQ) on your home machine – something I have not tried yet! It is extremely popular right now. If I was going to try this I would probably start with Leah Day’s Craftsy class. 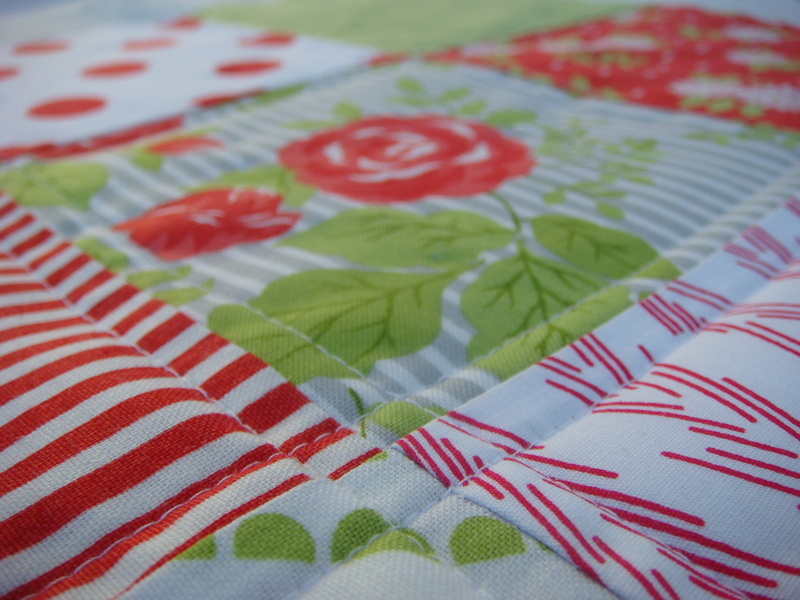 Hand quilting – you, a needle and thread, and your quilt. I love hand quilting. You can read my post here about a quilt I hand quilted. I used this tutorial from Sarah Fielke. I’m working on a larger hand-quilted project right now but it’s a secret! I’ll be able to share it after Christmas. Employing a professional long-arm quilter – hiring someone else to quilt your quilt for you. Some quilters never quilt their own quilts. Long-arm machines are mounted on a huge frame that holds the quilt in place while the “arm” of the machine actually moves the needle over the quilt. It’s pretty amazing. If you are interested in FMQ or hand quilting, it’s not a bad idea to consider practicing these skills sooner than later. It’s nice if your piecing and quilting skills grow together. My own personal favorite is fairly sparse quilting in straight lines that echo the piecing design. In this case we have square patchwork so I’m going to follow the straight lines 1/4 inch on either side of each seam. The first step is to attach your walking foot. Usually a sewing machine moves the material only from the bottom. With a walking foot attached, the material is moved from the top and bottom. This helps the 3 layers of your quilt sandwich feed evenly so you don’t get puckering. If you don’t have a walking foot, it’s not strictly necessary if you’re only making a mini like I am. But if you are making a larger quilt, you should really order one before quilting your quilt. If you’ve never changed the foot on your machine before, do not be afraid. I am the world’s least handy person and I have no trouble with this job. Just unscrew the screw, line up the walking foot and screw it on. Put your normal foot somewhere safe! I usually put mine in the little jar I keep my bobbins in. Make sure the little claw goes around the bar. If you want to use special thread this is the time to load it onto your machine. You can use the same thread you always use, or you can use quilting thread. This thread is a little thicker and shinier. You can either match the thread to your fabric or contrast it if you want it to show. 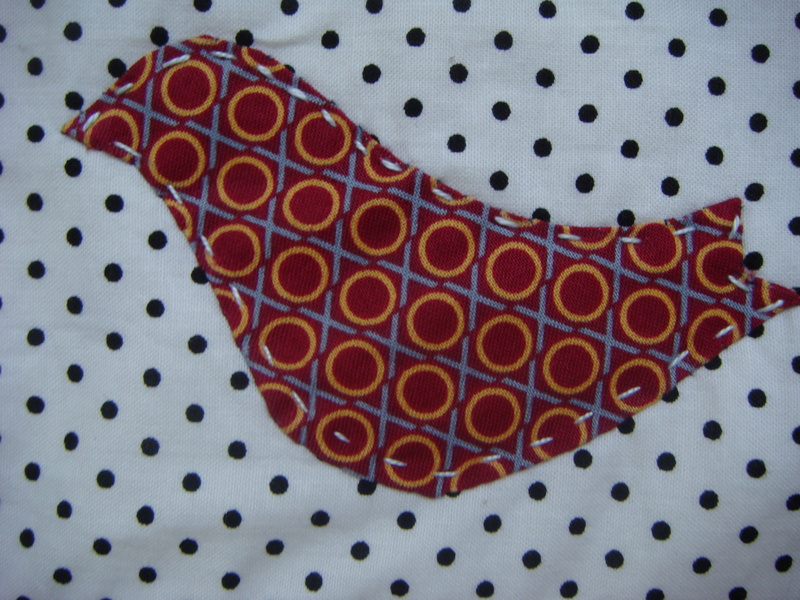 I frequently just use white Aurifil thread to piece and quilt. I would like to experiment with a heavier weight thread (and longer stitch length) that would show more but I have not done so yet. 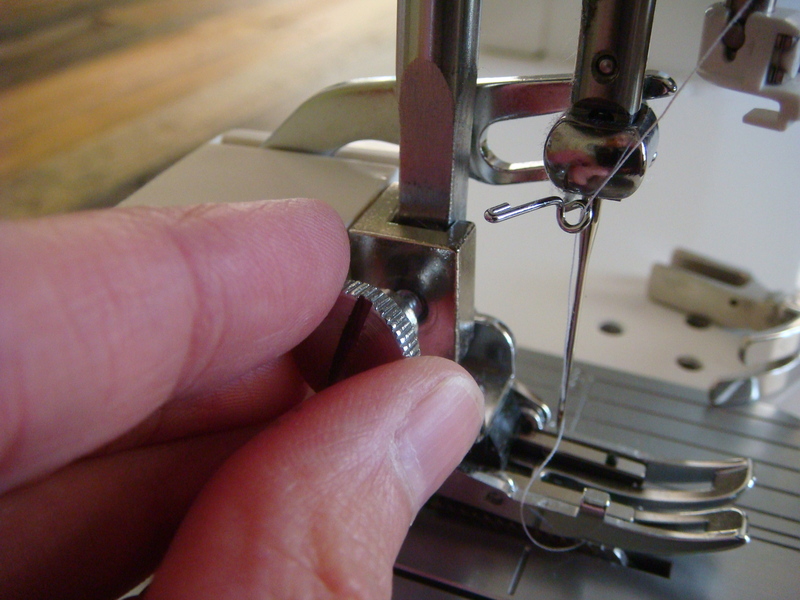 Generally speaking you should use the same thread weight in your bobbin that you are using on top. Ok now let’s quilt. Just like when we were putting in the basting pins, you usually want to start in the middle. This is to minimize any shifting that may occur, or at least spread the shifting around evenly so it isn’t too noticeable. On our mini this doesn’t matter because the middle is the same as the edge. 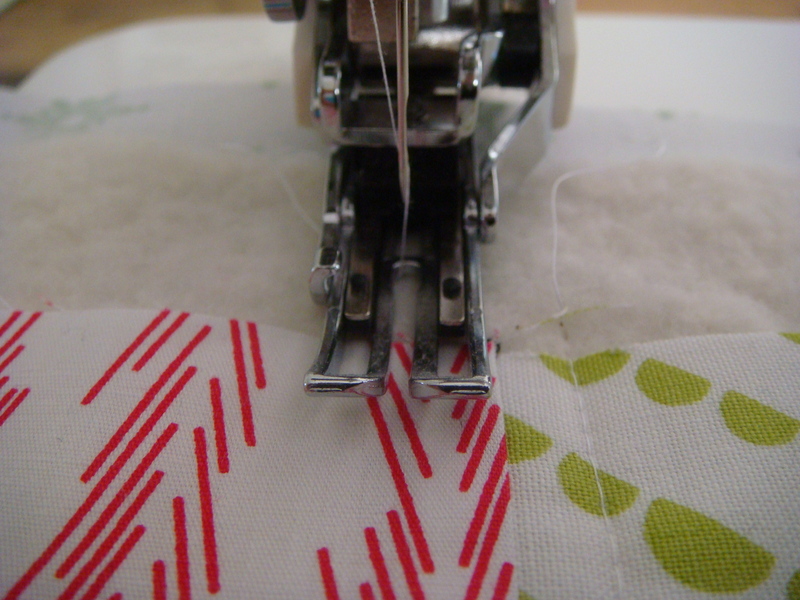 If you are quilting a large quilt you will need to roll both edges of your quilt so you can fit it into your machine. Hold up the two rolls with each hand and gently guide it. Don’t push or pull. Your job is to keep the line straight and make sure the weight of the quilt isn’t slowing the feed. The goal is nice even, straight stitches. 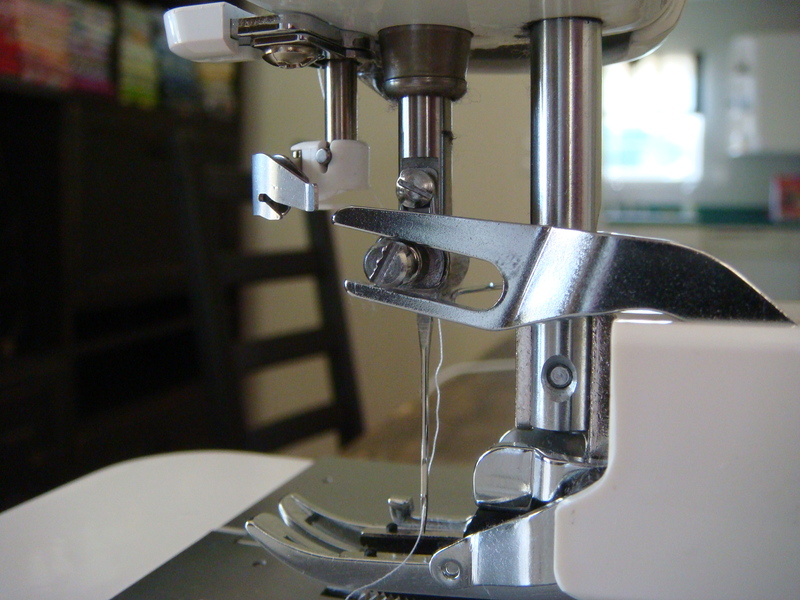 Sew a line approximately 1/4 inch from your seam. Use the edge of your foot as your guide. Now go back and sew on the other side of the same seam. Continue this, working out to one side of the quilt and then starting in the middle again to do the other side. Then rotate the quilt and do the perpendicular seams. Lovely! A quilted quilt. You can see I removed the pins after quilting. Unless one gets in your way, you should leave them in on the entire quilt until you are done quilting. Just one more step to go. We’ll tackle binding next, and then stand back and admire our work. 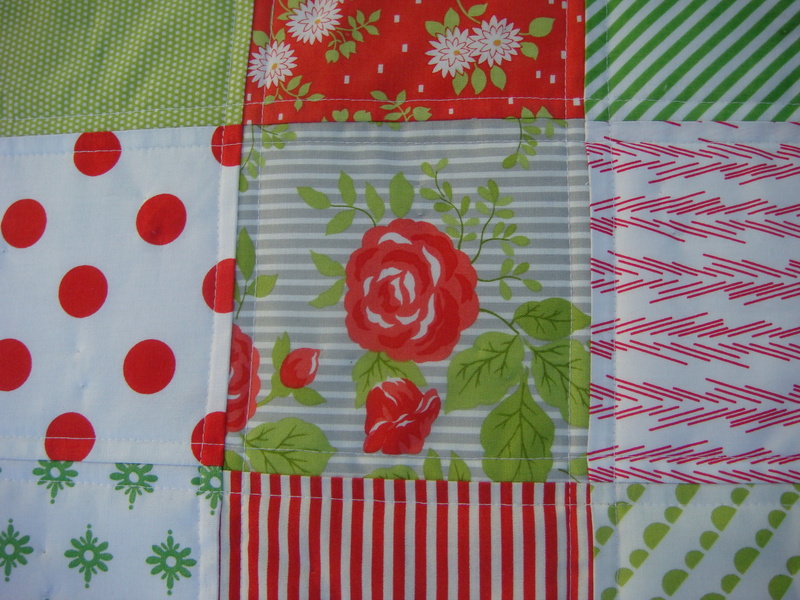 This entry was posted in Uncategorized, Your 1st quilt and tagged Quilting. Bookmark the permalink. I really appreciate you adding the photo of the walking foot arm over the screw! I have been quilting awhile but when I first got my walking foot it came with no instructions and I had no clue what to do! Nice pics! Really lets you see the parts and makes it clear. I think the machine is the scariest part for beginners. So you are supposed to start quilting in the middle! I thought that was just for putting in the basting pins. That’s handy to know, I’ll remember that for next time. And why should you leave the pins in until the end? your deliverer for completing a prescription test. Software transforms into usable within the it doesn’t call because extra rrrflexion to end up being learned. for many the perc Test.